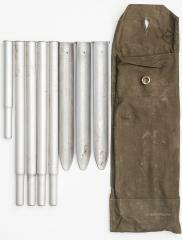 A "new" model tent accessory set of the Swiss army, updated from the old WW1 era set. 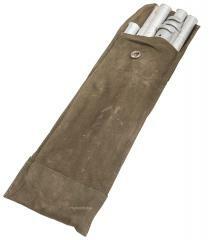 Includes a pouch, a bunch of tent poles and three stakes. Sometime in the 70's the Swiss army upgraded the shelter half accessories to full aluminium in a 34 cm long handy pouch with such magical inventions as The Belt Loop. Contains five pole pieces, one of them shorter because overdesign. Together they form a 1,2 m tall pole (diameter about 1,4 cm on the top).The three stakes are aluminium and overall surprisingly nice, being 24 cm long and concave shape. These should work with anything smaller than a half-platoon tent. Weight about 750 grams for the whole set. If you need a cheap pole & peg set to go with your tarp, this might be the ticket. No cordage included, though! Used, intact, but smells pretty bad. Great for pitching a tent or a tarp.